It is a procedure that make your teeth look and feel better, so when you smile people will admire you, it involves series of appointments in which the surface of the teeth is worked up on so we can cover them with veneer which is a layer of porcelain that's glued on top of the teeth, it requires a minimum invasive technique that does not require anesthesia, it requires a couple of appointments in which you come we do not anesthetize you, we do not shave the teeth we nearly just glue on the top of them a series of veneer which is a covering which is immediately make your smile look better, it can whiten your teeth at the same time, it can lighten the color and it reshape your teeth so they'll feel and look better. Restorative dentistry and implants improve your smile so that your teeth may reflect beauty, cleanliness and close to perfection. Restore the perfect function of your bite & allows you to chew better & prevents any deterioration of your teeth. Restorative Dentistry and treatment is basically filling your teeth when you have small or large cavities, putting crowns on your teeth when the cavities are too large to be dealt with through filling, and putting bridges to replace any missing teeth, now restorative treatment can include putting denture for people who lost all their teeth. Restorative treatment involves few appointments in which the teeth have to be cleaned, shaped down properly and impressions are to be taken so we can fabricate the proper crowns or bridges. As always, at the end of this swift and easy procedure, patients will go home with a great smile. Orthodontics treatment is another specialty in which the teeth can be straightened, to look and to feel better.Dr. Mitri is a certified provider for “Invisalign”, He has provided care for patients thru “Invisalign” since 2005. The average orthodontics treatment for “Invisalign” lasts between 9 and 12 months, it doesn’t involve putting any braces on your teeth, it nearly involves wearing retainers or aligners which are very clear and only few people will be able to tell that you’re wearing something on your teeth, you’ll wear them day and night, you’ll be able to take them out when you eat, it is the newer technology to straightened your teeth without the hassle of braces. Periodontal treatment deals with getting rid of gingivitis and gum diseases. It strengthens your gums and prevents bad breath. Periodontal includes gingivitis or gum disease. It affects a large number of the population. The treatment of periodontal disease can be as simple as a gum cleaning. To prevent periodontal disease, every patient should floss and brush his teeth properly. Periodontal disease treatment may include doing gum surgery and doing bone graft and gum graft and that become very complicated, but the basic of periodontal disease treatment is to keep or gums healthy, treat them well, brush them and floss them properly and come regularly for cleaning. Cosmetic dentistry, periodontics dentistry, restorative dentistry, teeth bleaching, veneers, teeth implants, teeth crowns, general dentistry, and more. Cosmetic Dentistry, Periodontics, Restorative, Including Bleaching, Veneers, Teeth Implants and Crowns in Washington DC since 1989. Long Years of practice Experience. The Most Updated Dental Equipments. Very Accommodating Hours Of Operation. 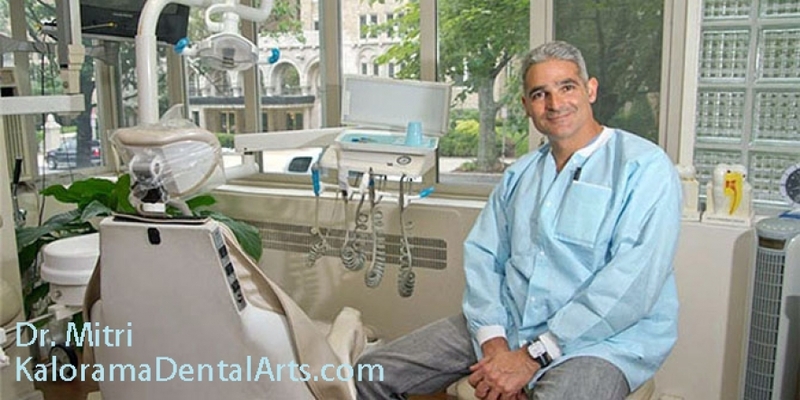 With over 28 years of practice experience, since 1989, Dr. Mitri has been serving the community of Washington DC area, using the most updated equipment. Considering that not everyone gets off of work at 5 PM, therefore we provide flexible hours of operation including evenings. At Kalorama Dental Arts we're taking the patients best interest as a priority: We accept several dental insurances and we charge moderate fees. Dr. Mitri is the only person that runs this practice and the only dentist that will treat the patients from the exam and cleaning to the more complicated treatments, as it is often said : "The buck stops here." Dr. Mitri examines the patient thoroughly and make decisions based on the exam and radiographs regarding the best dental treatment possible and offers the patient a minimum of two options and will facilitate the financial arrangements so your treatment can be affordable. We accept the following method of payments: Visa, Mastercard, Checks and Cash.